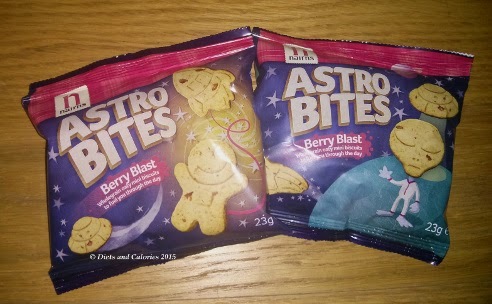 Astro Bites are the latest arrival from Oat Biscuit makers, Nairn’s. 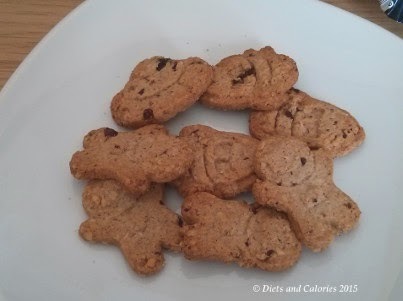 Aimed at the children’s market, Astro Bites are mini biscuits made from wholegrain oats and flavoured with cranberries and raisins. Their main selling point is that they contain 40% less sugar than the average children’s biscuit. Although they’re aimed at the kids market, I think they’re perfectly suited for adults too, especially since each biscuit has only 10 calories! OK, so they are tiny, but they’re portion controlled as they come in a 23g bag with each pack worth 104 calories. This means they’re useful for keeping as a handy snack at work, or to take with you when you have a snack attack. Because there are 10 biscuits in each bag, you can have a few a leave the rest for later! Well, that’s what I do when I'm feeling stronger willed. The biscuits themselves are shaped into different space type objects. For example, a UFO, A shooting star, a rocket and a planet which looks a bit like Saturn. Cute as they are, I was more concerned with how they tasted. Actually, they’re quite similar to the Mixed Berries Nairn’s Oatcakes reviewed earlier. I don’t usually like dried fruit in biscuits. However, the fruit in these isn't too intrusive and it provides a fruity chewiness as a contrast to the crunchiness from the biscuit. 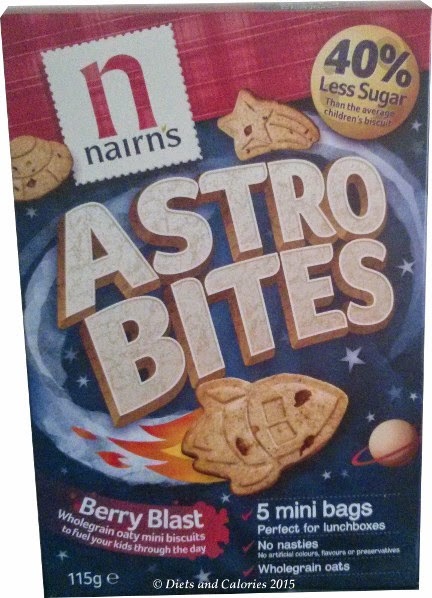 Nairn’s Astro Bites have 17.4g of sugar per 100g and 4g per bag. This is around 1 teaspoon of sugar per bag. Not bad considering that 17.4g is in the ‘High’ category for sugar. I was interested to see whether they really do have 40% less sugar than regular kids biscuits. So I checked out a few popular brands to see whether their claim is true. As you can see from the table above, Nairn's claim is pretty accurate. Since my review, I’ve given these to my children as snacks to take to school. They’re both very happy to eat these and did like their taste and crunch. However, they’d be just as happy with pretty much any other type of sweet biscuit as well! Nutrition information per 23g bag: 104 calories, 1.3g protein, 14.5g carbs, 4.0g sugars, 3.9g fat, 1.7g saturates, 1.4g fibre, 0.21g salt.